Previously, researchers could only image four to five genes at a time in cells with microscopy. This work builds off previous advances from the research team, including an earlier version of seqFISH from 2014 and research from 2017 that profiled over 10,000 genes under a microscope. Scaling seqFISH up to a genomic level now enables the imaging of over 10,000 genes—about half of the total number of genes in mammals—within single cells. 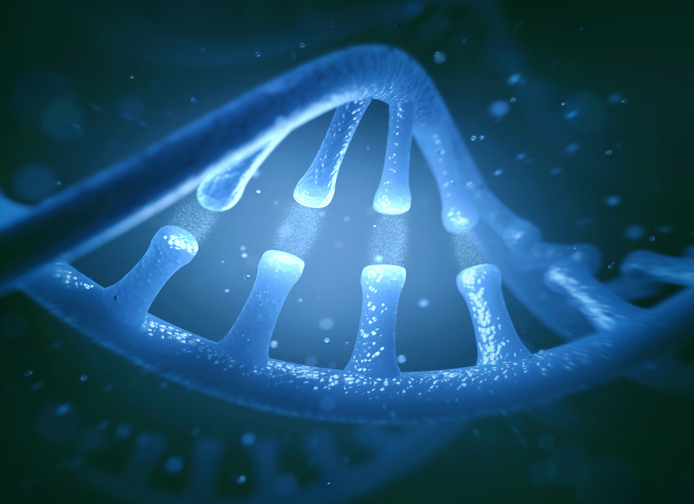 For genetic instructions to be turned into an actual functioning protein, transcription must first occur. This process often occurs in pulses, or “bursts.” First, a gene will be read and copied into a precursor messenger RNA, or pre-mRNA, like jotting a quick, rough draft. This molecule then matures into a mRNA, akin to editing the rough draft. During the “editing” process, certain regions called introns are cut out of the pre-mRNA. The Caltech team chose to focus on labeling introns because they are produced so early in the transcription process, giving a picture of what a cell is doing at the precise moment of gene expression. Using the newly developed intron seqFISH technique, each intron is labeled with a unique fluorescent barcode, enabling it to be seen with a microscope. Seeing introns reveals which genes are currently turned on in individual cells, how strongly they are expressed, and where they are located. Previous work, which developed the barcoding technique, focused on labeling mRNA itself, providing a measurement of how gene expression changed over several hours as the mRNA developed. Looking at introns enabled the researchers to examine, for the first time, so-called nascent transcriptomes. This led them to discover that the transcription of genes oscillates globally across many genes on a “surprisingly short” timescale compared to the time it takes for a cell to divide and replicate itself, which takes from 12 to 24 hours. This means that over the course of a two-hour period, many genes within a cell will burst on and off. There are several reasons why the oscillation phenomenon had not been observed previously. First, because these two-hour oscillations are not synchronized amongst different cells, the fluctuations are averaged out by methods that require many cells. Second, the high accuracy of the seqFISH method allows the researchers to be certain that what they observe represents real biological fluctuations, rather than technical noise. Last, these two-hour oscillations are obscured when mRNAs, rather than introns, are measured, because mRNA molecules have a longer lifetime, three to four hours, in mammalian cells. Additionally, because introns stay where the gene is physically located, fluorescently imaging introns allows researchers to visualize where genes are located within the chromosome, the large structure that DNA folds into within the cell's nucleus. In this work, the team was surprised to discover that most active protein-encoding genes are located on the surface of the chromosome, not buried inside of it.